The Pentagon is reportedly deliberating over putting elite troops and Special Forces in Afghanistan under CIA control. The move would reduce official US presence with a view to meeting Obama’s promise of total withdrawal from the country by 2014. Top US military sources told Agence France-Presse that the idea had been circulated by senior defense intelligence as a way to reduce US presence in Afghanistan before the 2014 deadline. It is one of several initiatives currently under discussion in the Pentagon, according to AFP sources. The proposals have not yet been presented to US Secretary of Defense Leon Panetta. Continue reading ‘US may use CIA cloak to hide Afghan presence‘ at Global Freedom Technology Firm. The corporate media said his body was deep-sixed at sea. Few if any corporate media “journalists” (script-readers) pointed out that this explanation was a totally absurd cover story. Few dared examine why the story changed several times. Cindy Sheehan had a sharp retort to those who believe whatever the government – caught lying countless times – and its corporate media propaganda wing tell them. at Global Freedom Technology Firm. Get Equifax ID Patrol Now! Get help with everything from dinner reservations to emergencies. MyAssist Personal Assistants do it all! Get a FREE 30 Day Trial Now! Ahmad Wali Karzai, the half brother of Afghan president Hamid Karzai, was assassinated by one of his own bodyguards Tuesday morning. Friend and trusted head of security Sardar Mohammed shot him in the head and chest. Mohammed was in turn shot and killed by fellow bodyguards. The Taliban claimed responsibility for the assassination. In 2009 it was reported that Karzai was a major player in the Afghan opium trade. According to reports, other members of the Karzai family are involved “head-to-heels” in the drug business. Ahmad Wali Karzai also worked for the CIA. According to a report in Presscore, the former Unocal employee Hamid Karzai and his family are heavily involved in the CIA’s drug business. “85 per cent of all drugs produced in Afghanistan is being shipped aboard US aircraft. Foreign diplomats have stated that the United States military buy drugs from local Afghan drug lords who deal with field commanders overseeing eradication of drug production,” states the report. The CIA provides protection for the enterprise. The CIA has been in the drug running business since the 1950s. In Burma, Vietnam, Laos, Latin America, and Afghanistan, the CIA — also known as the “Cocaine Import Agency” — has remained at the forefront of the international illicit drug trade. The journalist Gary Webb and the San Jose Mercury News tied the CIA and the Contras to a large crack cocaine ring in Los Angeles. Webb paid with his life for revealing this information to the public. Before the U.S. invaded Afghanistan, the Taliban had imposed a ban on opium production. This resulted in opium production collapsing by more than 90 per cent. It was the U.S. supported Northern Alliance that came to the rescue and began protecting the production of raw opium. “CIA-supported Mujahedeen rebels [who in 2001 were part of the Northern Alliance] engaged heavily in drug trafficking while fighting against the Soviet-supported government and its plans to reform the very backward Afghan society,” William Blum writes in The Real Drug Lords. In a Fox News report aired in April of 2010, correspondent Geraldo Rivera interviewed a solder in Afghanistan who admitted the U.S. allows the opium trade to flourish. Continue reading ‘Afghan CIA Drug Kingpin Shot Dead by Own Bodyguard‘ at Global Freedom Technology Firm. ESET Smart Security. Get award-winning virus protection with antispam and personal firewall. Bulk SMS Gateway – Send SMS’s from your PC; easy integration! After a double bombing in Pakistan’s north that resulted in over 80 deaths, the Western media was quick to report an unverified phone-call made from an “undisclosed location” to Reuters and AFP claiming the Taliban was responsible. Reuters stated, “Now Pakistani rulers, President Zardari and the army will be our first targets. America will be our second target,” Ehsanullah Ehsan, a spokesman for Tehrik-i-Taliban Pakistan (TTP), or Taliban Movement of Pakistan, told Reuters by telephone from an undisclosed location.” AFP reported similarly, “This was the first revenge for Osama’s martyrdom. Wait for bigger attacks in Pakistan and Afghanistan,” spokesman Ehsanullah Ehsan told AFP by telephone from an undisclosed location.” Both Reuthers and AFP never bother explaining who Ehsanullah Ehsan is or verifying their source. Far be it from the corporate-owned media to actually “inform” its audience. Mullah Ehsanullah Ehsan is a former member of the Taliban leadership. Originally, he was the chairman of the Taliban’s Central Bank. Later, Ehsan was the Taliban’s Administrator of Captured Provinces. Shortly after the Taliban took over major Afghan institutions in December 1996, Ehsan, acting as chair of the Central Bank, declared most Afghani notes in circulation to be worthless and cancelled the contract with the Russian firm that had been printing the currency. Ehsan accused the firm of sending new shipments of Afghani notes to ousted president Burhanuddin Rabbani in northern Takhar province. “Mullah Ehsanullah Ehsan is a current Taliban spokesman and former member of the Taliban leadership. Originally, he was the chairman of the Taliban’s Central Bank. Later, Ehsan was the Taliban’s Administrator of Captured Provinces. With the recent death of Osama Bin Laden, Ehsanullah Ehasan may once again take a more active leadership role in the Taliban. Besides another tremendous torpedo to Wikipedia’s credibility, the poorly cited entry still doesn’t tell us who Ehsanullah is and where he came from. The only other “Ehsanullah” that can be found online is an Ehsanullah Ehsan who has spent his years after the fall of the Taliban in 2001 building schools and teaching. 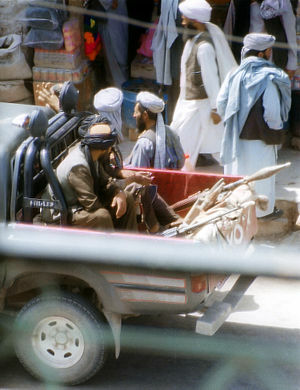 In a 2009 St. Peterburg Times article titled, “Taliban Gaining Unexpected Grounds in Afghanistan,” Ehsan is described as a “a government official in the Taliban Ministry of Foreign Affairs” who works tirelessly to bring communities together, bridge differences, and solve problems through carefully weighed, culturally sensitive pragmatism. The Toronto Star features an April 2011 piece written by an “Ehsanullah Ehsan” titled, “I can tell you that we are bleeding in our hearts,” in which the school teacher/principal laments that violence and hatred on both sides threaten to undo the work he and his people have done over the years to move his nation forward. Perhaps Ehsanullah Ehsan is a common name. Perhaps all three are different men. Perhaps Reuters and AFP received a phone call from a nearby CIA station using an outdated Taliban Rolodex. When the media continuously and profoundly fails its duty to investigate, verify, and inform us, we are left to speculate, doubt, and ultimately question the legitimacy of such agencies. Land Destroyer for its part, is currently investigating this matter further. What must be realized by all involved, from Pakistan’s neighbors to the Baluchis and Pashtuns within Pakistan, is that any alliance with America is an alliance sure to be betrayed, sure to lead to a divided and weakened Pakistan that will be exploited in full by the global corporate-financier elite engineering American foreign policy. Consider those joining men like Khalizad on the CSIS and NED boards are Carlyle Group members, defense contractors including Raytheon and Boeing, banking interests represented by Merrill Lynch, Lehman Brothers, and Morgan Stanley, and big oil interests represented by Hess, Exxon, and Chevron. These are the same megalomaniacal, warmongering, parasites that have bankrupted the West, morally, culturally, financially, economically, and industrially. They have every intention to duplicate their “success” throughout Asia if given the proper environment of apathy, ignorance, and complicity within which to flourish. Nations like India must realize that while their grievances with Pakistan may seem important, the US is not helping India out of a sense of charitable solidarity, but as a means to use Indian troops and resources against Pakistan, possibly even against China, thus miring all three nations in unending conflict and effectively hobbling their collective development. At the end of the day, there is no seat at the table for Chinese, Pakistani or Indian elite. They will be divided, discarded, and domineered just as soon as their usefulness reaches an end. As plans to divide and dominate Pakistan become public knowledge, and with plans to do likewise in Iran, China, and throughout the Middle East already matters of fact, India must reevaluate its relationship with Pakistan, as Pakistan must do so with India, understanding that their rivalry serves as the perfect “strategy of tension” from which the forces of globalization will conquer both nations. Enjoy These Big Deals at Network Solutions! Register .CO Domains for $11.99 & 50% off select products, Hosting & More! Shop Now! The growing use of unmanned aircraft in combat situations raises huge moral and legal issues, and threatens to make war more likely as armed robots take over from human beings, according to an internal study by the Ministry of Defence. The report warns of the dangers of an “incremental and involuntary journey towards a Terminator-like reality”, referring to James Cameron‘s 1984 movie, in which humans are hunted by robotic killing machines. It says the pace of technological development is accelerating at such a rate that Britain must quickly establish a policy on what will constitute “acceptable machine behaviour”. 15% Off a Minimum Purchase of $15. “It is essential that before unmanned systems become ubiquitous (if it is not already too late) … we ensure that, by removing some of the horror, or at least keeping it at a distance, we do not risk losing our controlling humanity and make war more likely,” warns the report, titled The UK Approach to Unmanned Aircraft Systems. MoD officials have never before grappled so frankly with the ethics of the use of drones. The report was ordered by Britain’s defence chiefs, and coincides with continuing controversy about drones’ use in Afghanistan, and growing Pakistani anger at CIA drone attacks against suspected insurgents on the Afghan borders. It states that “the recent extensive use of unmanned aircraft over Pakistan and Yemen may already herald a new era”. Referring to descriptions of “killer drones” in Afghanistan, it notes that “feelings are likely to run high as armed systems acquire more autonomy”. The insurgents “gain every time a mistake is made”, enabling them to cast themselves “in the role of underdog and the west as a cowardly bully that is unwilling to risk his own troops, but is happy to kill remotely”, the report adds. Pakistan last week demanded that the US stop drone strikes and the CIA drastically cut its officers there. David Cameron said in December that British drones had killed 124 insurgents in Afghanistan since June 2008, hailing them as a “classic example of a modern weapon which is necessary for today’s war”. 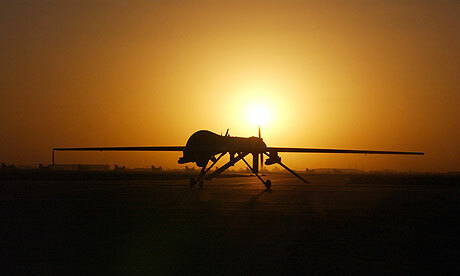 The drones, known as Reapers, have to date fired 167 missiles and bombs in Afghanistan. The report was drawn up last month by the ministry’s internal thinktank, the Development, Concepts and Doctrine Centre (DCDC), based in Shrivenham, Wiltshire, which is part of MoD central staff. The centre’s reports are sent to the most senior officers in all three branches of the armed forces and influence policy and strategy. The concept of “fighting from barracks” or the “remote warrior” raises such questions as whether a person operating the drones – sometimes from thousands of miles away and “walking the streets of his home town after a shift” – is a legitimate target as a combatant. “Do we fully understand the psychological effects on remote operators of conducting war at a distance?” ask the officials. There is one school of thought, they note, that suggests that for war to be moral, as opposed to just legal, “it must link the killing of enemies with an element of self-sacrifice, or at least risk to oneself”. “The role of the human in the loop has, before now, been a legal requirement which we now see being eroded,” the MoD report warns. It asks: “What is the role of the human from a moral and ethical standpoint in automatic systems? … To a robotic system, a school bus and a tank are the same – merely algorithms in a programme … the robot has no sense of ends, ways and means, no need to know why it is engaging a target.” Chris Cole, a campaigner who runs the Drone Wars UK website, which monitors the development of unmanned weapons systems, welcomed the MoD study while calling for a halt to the use of drones by British forces. “There needs to be an open and public discussion about the implications of remote warfare, and it may be that a parliamentary select committee inquiry would be the appropriate forum to begin this discussion,” he said. The report notes that the MoD “currently has no intention to develop systems that operate without human intervention in the weapon command and control chain”. However, the MoD, like the Pentagon, is keen to develop more and more sophisticated “automated” weapons, it admits. The report also identifies advantages of an unmanned weapons system, such as preventing the potential loss of aircrew lives, which mean it “is thus in itself morally justified”. It adds: “Robots cannot be emotive, cannot hate. A robot cannot be driven by anger to carry out illegal actions such as those at My Lai [the massacre by US troops of hundreds of unarmed civilians in South Vietnam in March 1968]. The US-manufactured General Atomics Reaper is currently the RAF’s only armed unmanned aircraft. It can carry up to four Hellfire missiles, two 230kg (500lb) bombs, and 12 Paveway II guided bombs. It can fly for more than 18 hours, has a range of 3,600 miles, and can operate at up to 15,000 metres (50,000ft). The Reaper is operated by RAF personnel based at Creech in Nevada. It is controlled via a satellite datalink. Earlier this year, David Cameron promised to increase the number of RAF Reapers in Afghanistan from four to nine, at an estimated cost of £135m. The MoD is also funding the development by BAE Systems of a long-range unmanned aircraft, called Taranis, designed to fly at “jet speeds” between continents while controlled from anywhere in the world using satellite communications. When Wikileaks released thousands of classified US diplomatic cables this week, a familiar criticism was repeated by the project’s foes: these leaks could harm innocent people. There’s no evidence of that yet, but within the documents there is evidence the American government has harmed innocent people. One of them is Khaled El-Masri, a German citizen of Lebanese descent, and a victim of so-called “extraordinary rendition.” He was a car salesman in Germany, a father of six. The CIA kidnapped him by mistake (his name sounds and looks identical to that of an actual terror suspect), and sent off to receive months of torture in Afghanistan. When the CIA realized he was innocent, he was flown to Albania and dumped on a back road without so much as an apology. El-Masri’s futile efforts at receiving justice in the U.S. are well-known, but the cables published this week by Wikileaks include revelations the U.S. also warned German authorities not to allow a local investigation into his kidnapping and abuse. The nearest he’s gotten to justice is an arrest warrant for 13 CIA agents issued by prosecutors in Spain, which they entered on forged passports. In this video, originally part of the Witness.org documentary OUTLAWED, El-Masri relates his experiences. Boing Boing presented a portion of this documentary on our video channel back in 2008; the documents brought to light by Wikileaks provide an opportunity to revisit the story with new context. Buyer’s Edge – Cameras, TV’s, Appliances & More. Shop Buyer’s Edge Today! Tearing down sovereign nations & replacing them with global system administrators. Yet they directly referred to "Muslims" following Christchurch mosque attack. "There is an impression, sometimes, of there being hierarchies in place regarding these emotions." Alex explains that now is the time to investigate those deep state actors that use the Democrats to gain power. Agency has not assessed whether systems meet privacy and accuracy standards.